This screen print is part of the Till Death Do Us Part skull series. 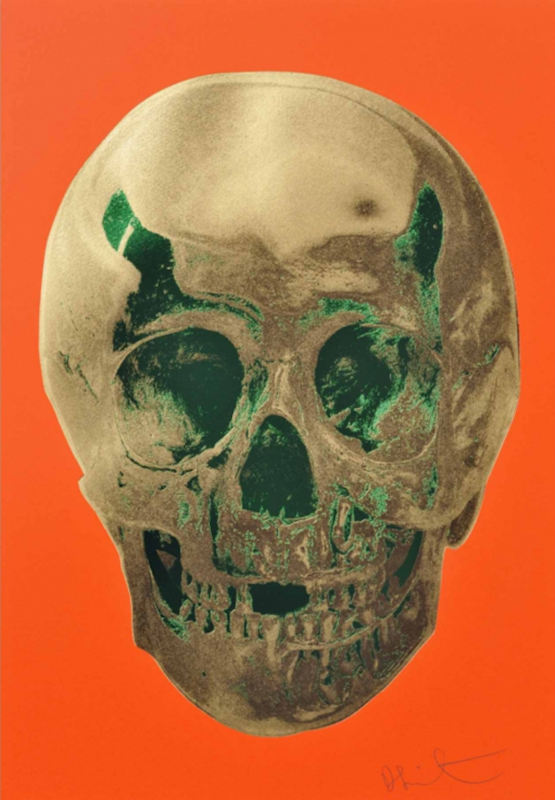 Damien Hirt’s Skulls takes a direct and challenging approach to ideas about existence, transforming the symbolic skull of death and decay into a glorious memento mori. Common to his work, Hirst often questions our awareness and convictions about the boundaries that separate desire and fear, life and death. Since the late 1980’s, Hirst has used a varied practice of installation, sculpture, painting and drawing to explore the complex relationship between art, life and death. Explaining: “Art’s about life and it can’t really be about anything else … there isn’t anything else,” Hirst’s work investigates and challenges contemporary belief systems, and dissects the tensions and uncertainties at the heart of human experience. At Goldsmiths, Hirst’s understanding of the distinction between painting and sculpture changed significantly, and he began work on some of his most important series. The ‘Medicine Cabinets’ created in his second year combined the aesthetics of minimalism with Hirst’s observation that, “science is the new religion for many people. It’s as simple and as complicated as that really.” This is one of his most enduring themes, and was most powerfully manifested in the installation work, ‘Pharmacy’ (1992).